H.E. Yahya bin Said bin Abdullah Al-Jabri, Chair of Board of Directors of Special Economic Zone Authority in Duqm (SEZAD) signed today (9 February 2017) four agreements to implement a number of infrastructure projects in SEZD at a cost of about OMR 84,700,000. The signing of these agreements was part of SEZAD efforts to complete SEZD infrastructure projects within the Ninth Five-Year Plan and development until 2020 and make Duqm a city that attracts business activities and investments and a favorite destination for work and residence. The signing of these agreements is also part of SEZAD plans to set up a system to drain surface water and provide the appropriate protection for the projects currently implemented in SEZD. These include the construction of protection dams and major and secondary drainage channels with capacities sufficient to drain wadi waters through collecting rainwater and discharging it in the sea in a safe manner and based on appropriate amounts of rain expected in SEZD. The second agreement signed today with the SERKA with Rajab & Aidi Earthmoving Co. Joint Venture stipulates the construction of two drainage channels. The first is Wadi Jarf Channel Valley about 12 kilometers long and 340-650 meters wide at the final exit at the sea. The second channel is Wadi Sai Channel of 10 kilometers long up to the meeting point with Wadi Jarf Channel of 90-320 meters wide. The agreement price is OMR 49,7 Million. Mr. Hunkar Adali, Authorized representative of SERKA and Mr. Fathi Said Ayedeh Authorized representative of Rajab and Aidi Earthmoving Co., signed the agreement for the executing companies. The first agreement signed today related to construction of two protection dams to protect, one over Wadi Jarf of 19.4 meters high and 1.6 kilometers long with a storage capacity of 32.8 million cubic meters, and the other on Wadi Sai of 16.4 meters high and 3.3 kilometers long with a storage capacity of 17 million cubic meters. Premier International Projects Company shall implement the project at a cost of OMR. 27,0 Million and expected complete by the end of 2019. Mr. Mohan Babu, Managing Director, signed the agreement on behalf of the executing company. The agreements signed today also includes the Construction of Interface Roadway Project at Duqm (Section 4) at a cost of OMR. 7,2 Million awarded to Al-Hajri Trading Company whose Chair, Mr. Nasser bin Khamis bin Juma Al-Hashar, signed the agreement on its behalf. The project involves the Construction of an Interface road from the Main Road (Sultan Said bin Timor Road) that goes along Duqm from the south to the power station, in addition to another link passing through the site of Sebacic Oman Company situated to the north of Duqm Port. 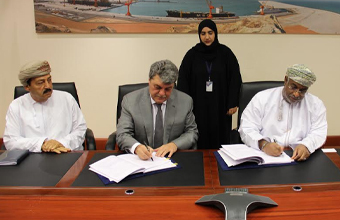 According to this agreement, the Company shall build a dual carriageway of 2.2 kilometers long and single roads of 3 kilometers long in addition to two dual entrances to Duqm Refinery with a total length of 574 meters. The works shall include traffic signals, two roundabouts, concrete channel for rainwater drainage of 3830 meters long, concrete box culverts, Streetlighting, and protection of existing services. The cost of the fourth agreement signed today was OMR. 752 Thousand It provides for the construction of a service road of 790 meters long along the tourism road in Duqm along with parking spaces for 63 buses, pedestrian paths and concrete channel for rainwater drainage of 740 meters long. The works also include concrete culverts, Streetlighting, parking spaces and protection of existing services. Mr. Simon Karam, Chief Executive Officer of the executing company, Al-Sarooj Construction, signed the agreement on behalf of the Company.